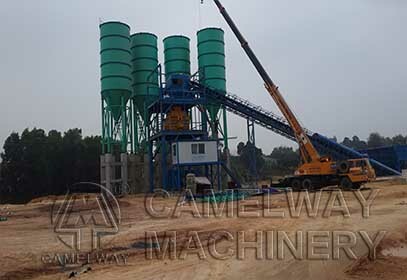 The asphalt mixing plant is also known as asphalt concrete mixing plant, which can produce asphalt mixtures, modified asphalt mixtures, and colored asphalt mixture and fully satisfy the needs of the construction of highway, classified highway, municipal administration path, airport, harbor. The asphalt mixing plant is consisted of batching system, drying system, combustion system, heat hoisting, vibrating screen, hot material storage warehouse, weighing mixing system, asphalt feeding system, filler feeding system, dust pelletizing system, finished product bin and control system. The asphalt mixing system is made of a kind of high-strength wear-resistant flooring material. This kind of material can improve its service life. Asphalt mixing plant，using imported electric linear vibrating screen, which can not only increase the screening efficiency but also lower the operating trouble. The aggregate elevator of the asphalt mixing plant lifts with plate link chain, increasing the service life of the elevator and improving the stability of operation. After optimizing the lifting plate material of drying roller, the drying system is becoming more stable. After adopting the modular design, the carry and installation of the asphalt mixing plant for is becoming convenient and quick. This entry was posted in Solution and tagged cocnrete batching plant by camelway. Bookmark the permalink.